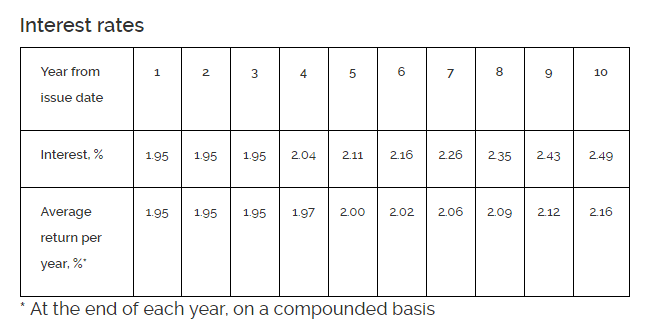 However, if you only hold the SSB bonds for 1 year, with 2 semi-annual payments, your interest rate is 1.95%/yr. $10,000 will grow to $12,169 in 10 years. 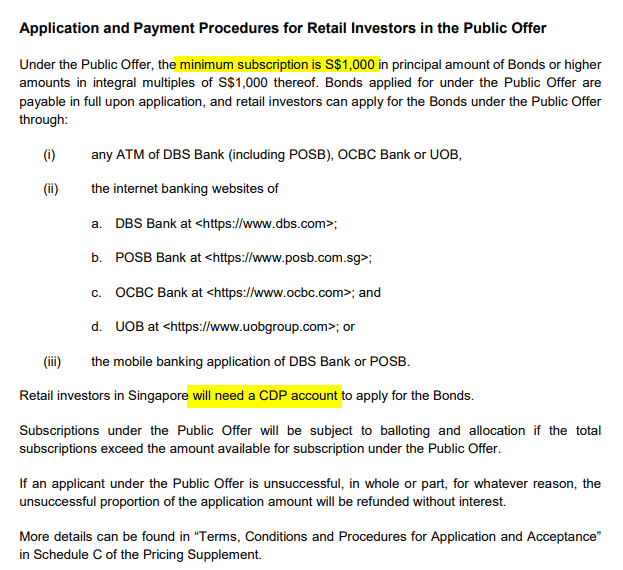 A single person can own not more than SG$200,000 worth of Singapore Savings Bonds. You can also use your Supplementary Retirement Scheme (SRS) account to purchase. 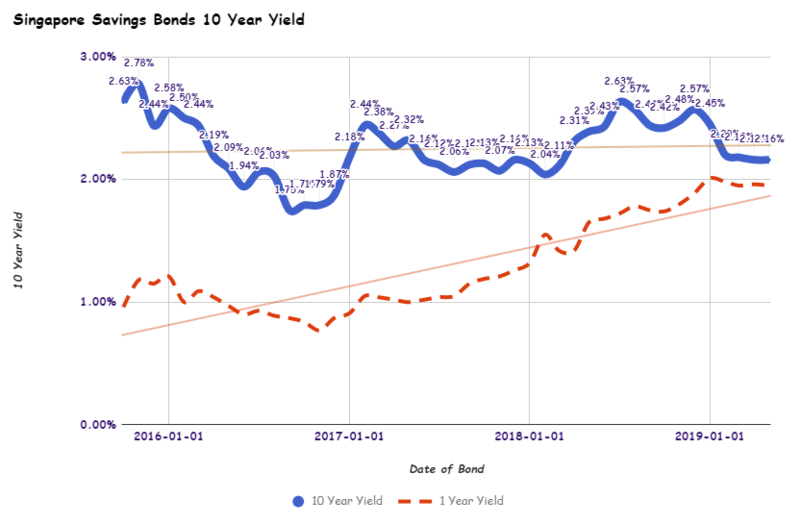 Last month’s bond yields 2.16%/yr for 10 years and 1.96%/yr for 1 year. Back during my army days, we would meet all sorts of different characters. I guess that is the same for you as well. It is good exposure for a sheltered JC kid to mix with people on the “other side of the track” to learn from their experience. Our team, for some reason happened to have 2 batches of NS boys who were from JC background. And one member who did not complete Poly. And he is one colorful character. Colorful things but many things best not shared on Investment Moats. The cleanest, most tattoo-less Ah Beng. Probably teaches better tuition then myself. Various entertaining past love stories. At times he can be rather reflective about things and one topic that often came up… is the contrast between folks in his world and… JC boys. There were not a lot of conflicts. We were able to see past that education backgrounds and see each other as individuals because whichever background that you came from, you can find weird people, smart people, people you do not wish to be around, and cool people you want to be around. There was one day where the topic drifted to another one of us. We both acknowledge that this guy stands out because he does not venture to do some of the things we would do due to a set of idealism that he have. I respected him for being able to be disciplined to stay that way (other than some of the times we made him break it!) most of the time. My Ah Beng mate reflected and say that is probably a very tiring way to live. When you have so much principles, you get dictated by it. I think as folks whose whole career is based on studying, that comment on idealism did not hit that hard until I draw some similarities between this and the way you run my own stuff. These kinds of principles, idealism eliminates a lot of things you could do and places handcuffs on you. The reward is that you probably felt more livable about it. Principles and idealism became a boss with a set of tasks that you should do or not do. They are a kind of obligations in life. The thing about obligations is that we do not notice the effects of one obligation on our lives. Collectively, they can have an affect on our time and our finances. And we often do not see this linked there. As the link between obligations and money is weak, we often did not realize how much it impacts the wealth we need for retirement and our ability to accumulate for it. So this post serves to deconstruct this topic of obligations and money. Obligations to put it simply, are things or projects that you need to do. These things and projects can be recurring and they could be many one time only things. The thing about obligations is that they could be the result of people giving you that responsibility. They could also be the return favors that you need to do because someone did something for you last time. They can also be the responsibility given to you because you are a human being, growing up in an ethnic background, with a certain culture. They could be something you are perfectly fine to take on, or that you take on begrudgingly. Now here are some obligations and you tell me if you have taken on them. Obligation has an impact on your financial independence goal. The amount you need to accumulate is very much linked to your annual expense when you need it in financial independence. If your expense is $3000/mth or $36,000/yr and you sought to spend 4% of your wealth in the initial year, you will need $36,000/0.04 = $900,000. Your subsequent year’s annual expense will increase by inflation. There is constant debate whether it is “safe” to withdraw 4% of your initial wealth (that is why it is called the safe withdrawal rate or 4% Rule). My take is that, the 4% withdrawal rate is deemed safe based on the body of work based on historical data we have in the USA. In actual implementation, we often recommend forming a safe income floor + a more volatile higher return portfolio strategy. The safe income floor provides the cash flow for your essential expenses. The volatile higher return portfolio takes care of the non-essential expenses. If the portfolio performs well, harvest more for the non-essentials. If its the opposite, constrained your spending. So we can look at the 4% initial withdrawal rate as a combination of the more safe 2.8% initial withdrawal rate + a variable 1.2% initial withdrawal rate. So if your annual income is $36,000/yr, your essential expenses will be satisfied by $25,200 and non-essential expenses will be satisfied by $10,800. For subsequent years, your $25,200/yr meant for essential expenses will rise by the rate of inflation, but should still be conservative. For subsequent years, how much you spend on the $10,800/yr will depend on the market returns, and your requirement. It can be very rules based (check out some of the variable withdrawal strategies). This plan, balances between conservative and flexible. You ensure that you address the security of your most basic needs, and sensibly spend more if you do well, spend less when you do not. Obligations, are things that you MUST do. Generally speaking, that means that they are essential to you. So they can be recurring and non-recurring. Overtime, your obligations will keep increasing and you will be basing your retirement estimation on this total annual expenses. What you should do is try and make some of these obligations, less of an obligations, and more of optional projects. So going back to our $36,000/yr example, if your life is filled with a lot of obligations pilling up, that means your essential expenses is a lot. It might be so much that $36,000/yr is not enough at all, due to so much obligations. If all your expenses are essential, then that 4% might not be very safe, based on some poor historical sequence such as the 30 year period starting in 1968 to 1998. Most of you are risk adverse. What this means is that you would want your plan to be rock solid and cover your bases. So if all your $36,000/yr are essential expenses, then to be safe you would need to accumulate $36,000/0.028 = $1.285,714 instead of $900,000. This is 43% more than $900,000. Here are some areas of obligations and money for you to think about. Whenever you set your mind to take responsibility of an obligation, do remember that inevitably, there are money linked to it. If you look to provide for your niece education, that is a worth while goal. It does not hide the fact that money will flow out of your pocket on a recurring basis for this. Taking on obligations need not always be about money. It involves a lot of time in certain situations. And time and money in a lot of situations can be traded. Knowing this link between money & time and obligations is an awareness problem. And most of us are not aware of this, if we do not explicitly talked about it. Some of you tend to be more altruistic and chivalrous, and take on obligations, despite your poor financial situation. Basically you took on more than you can chew upon. For some its even worse, they cannot say no. They find it very difficult to reject people. So they ended up taking on a lot of obligations. And since obligations sap a lot of time, and money, then end up in a tough financial situation. The worst thing is that they do not feel good about taking on these obligations. So they end up rather drained by these obligations. If you see a purpose why you took on those obligations, you might be motivated by that challenge. When that is not your purpose, then that is a tough situation to be in. A lot of us planned our retirement with our financial planners at the start when we buy our unit trust. And we never revisited this conversations again. What you think you need might have changed over time. We also failed to see that the 25 year old, which the original plan was based upon, is totally different from the 45 year old as a person. The 45 year old sees a different life priority compared to the 25 year old. The 25 year old could never see his life priorities 20 years later. What this means is that the amount that you need for essential expenses might be very different from what you think. It should also be said that you might lose some obligations, you might gain some obligations as well. I guess the opposite of obligations are things and projects that you do not always need to do. Make them optional. The more that you can make them optionals, the more you can structure a plan that is conservative and flexible at the same time. When you move more to optionals you can essentially form an annual expense of Essentials and Non-Essentials. With that at least you can estimate the amount you need to accumulate to cover the essentials based on a safer initial withdrawal rate. Because the essential amount is smaller, you need to accumulate less. I had this conversation yesterday with some of my co-workers on why Singaporeans work and why Singaporeans play games. They seem to think that gaming is to fill a void and that work can never be meaningful. So their response was that work is poor, but it is better to use work to fill the “empty void” then not working and have that empty void. I was astounded by this, and perhaps why we have people in the office functioning like zombies. Obligations, while it forces you to do something that might be out of your comfort zone, can be use as a positive motivator. If it is a philosophy that you feel strongly about to be committed to, then it becomes the driver to push you through challenging times. Research have shown that there are folks that didn’t respond to retirement very well because there is a 180 degrees change in their life. They were engaged in something that, they might not know its purposeful, to a situation where there is no purpose at all. That lost of purpose affects them like a virus would. Without obligations -> Nothing on the line -> Very little dependence on you -> People do not need you -> You feel less significant of your position in society -> You questioned your existence -> You will have a large void to fill up. I think we often do not discuss our responsibilities as a subject for wealth accumulation and in financial independence. If we frame our time and money in terms of responsibilities and obligations, it will allow us to right sized it. A recent article by New York Times explained that the best way to figure out your expense is not to talk about what you had spent in the last few years. It is more to talk about what you would do in a typical day and then figure out the amount of wealth that we need to support that. And that is probably the right way to think about your obligations and responsibility. Go through what you have now and what becomes more optional. Also go through what new responsibilities that you would want to add in now that you do not have a job anymore. Then we would be able to work out how much you have now, versus how much you need to spend and assess if your plan is still safe. My other materials on retirement and philosophy of money can be found below. As my readers, I guess you tend to be a more financial savvy bunch. Some of you might see yourself leaving your current job, which you are less enthusiastic about, or going nowhere, for a job that matches your interest better. Better yet, some of you have somehow drank the same money juice as myself, and have accumulated the bulk of your wealth, and have enough safety net, or runway, to work in an area that you are doing frequently outside of your day job. 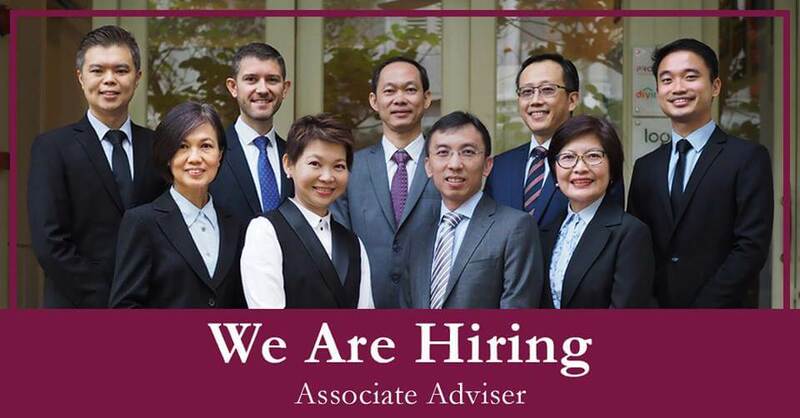 My friend Christopher Tan‘s company Providend is looking for an Associate Adviser. Providend is a fee-only financial advisory firm. .They are probably the only one in Singapore. You do not need to generate your own leads. Eventually it is to groom you to have a deeper stake in the advisory business, so that you will grow with the company together. One of the main problem facing financial planning firms in countries like the USA is that the experienced planners are getting ready to retire themselves, but have a difficulty transitioning their business to a younger generation. So the firm is probably planning ahead and seeding the next generation with this. If this associate adviser role fits what you are looking for, you can email your cover letter, portfolio and resume to them at [email protected]. If you are already a commissioned adviser, with a list of clients, but would like to transitioned to become one on a fee-only framework, you can contact me directly. I may be able to put you through to my friend Chris to discuss the nuances whether that is possible at all. I don’t get anything out of this. I just think that some of you might fit this and this company might fit you. Seems the prediction is shaping up really well. 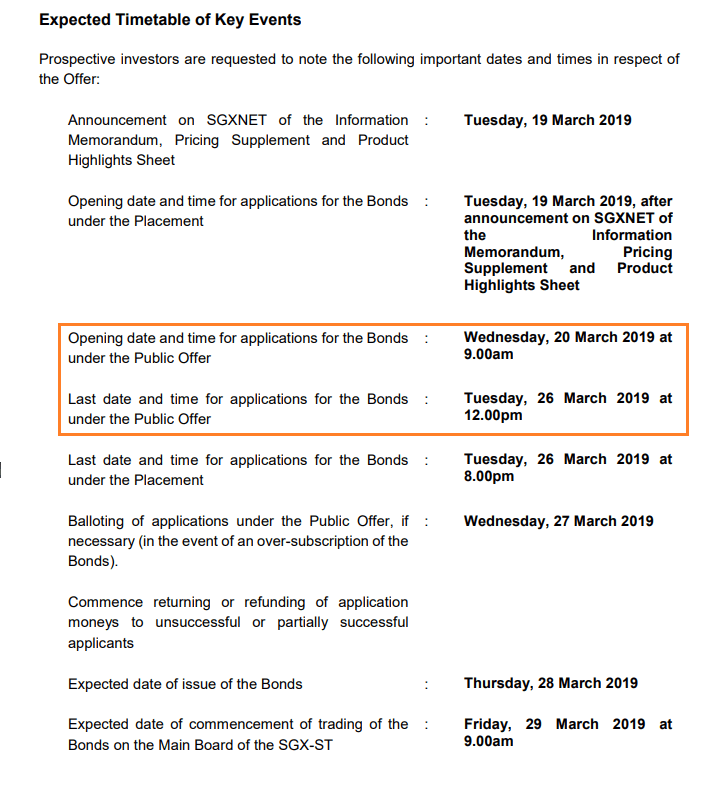 After Astrea IV 10 year 4.35% and Temasek 5 year 2.70% bonds, SIA followed their cue to release a retail tranche for their just announced bond issue. 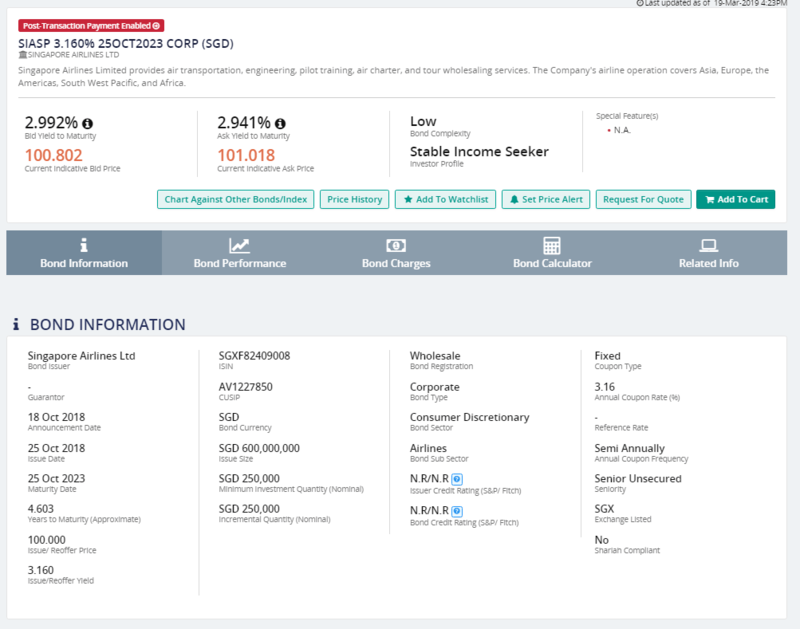 SIA will be releasing $500 mil worth of bonds, with the public being allocated $300 mil out of this and the rest going to institutional investors. Should the bond be oversubscribed, they will expand it up to $750 mil. A low denomination will also allow you the retail investor to diversify their bond allocation. The bond pays a coupon of 3.03% semi annually. At the end of 5 years, you get back your principal. If SIA cannot pay the coupon, or the principal, they default on your bond. Then you will go through the same liquidation procedures that the Hyflux creditors are doing right now. What you need to do is to access the ability for SIA to pay the interest on their debts. SIA issued $600 mil worth of bonds last year at a yield pretty similar to the current one. That bond is not rated, and while it is not stated, I do assume that this bond is also not rated. This bond, issued in 2018, currently trades at 2.99%, which is not too far off this issue. The yield is hardly exciting and perhaps a reflection of the credit worthiness of the issuer. This yield is slightly higher than last year’s hot Temasek 5 year 2.70% bond. For reference, the yield on the 10 year SGS bond is 2.10% and the 5 year SGS bond is around 1.99%. 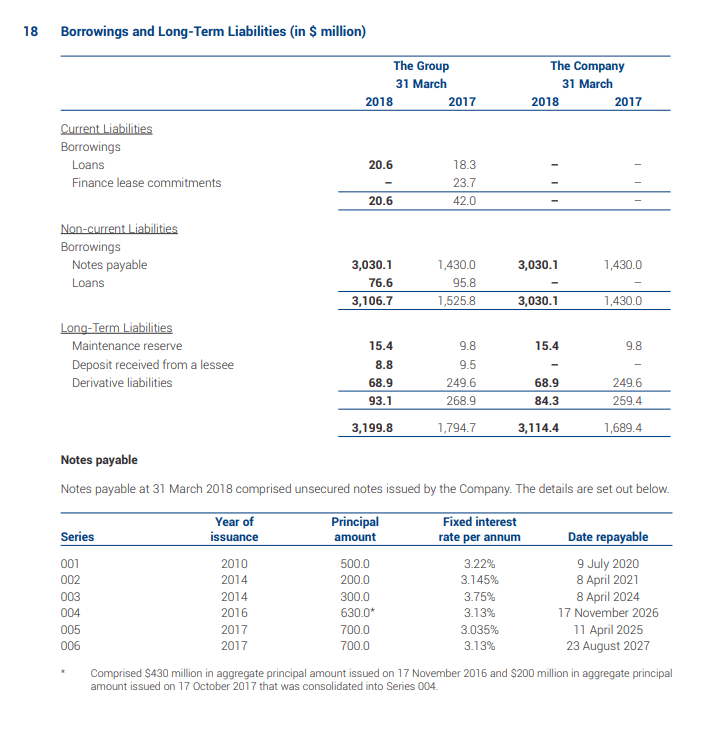 Still, maybe it is a good idea to take a look at SIA’s financials. We observe the operating cash flow before working capital and net operating cash flow to be many many times the interest payment on debt. The net debt to asset also showed that in the past 10 years, SIA have been in net cash position (cash more than debt). However, this has been deteriorating. SIA is now in net debt position. However, the level of debt is still very very low. The illustration above shows the latest debt schedule for SIA currently. There are not much bank loans and majority are bond issues in the past. 2 bond issues are coming due in 2020 and 2021, and it might be the case this issue is used to refinance one of the loans expiring in 2020. 6 days prior, SIA have announced that they have set up a $2 billion medium term bond program, which will be used to refinance existing borrowings, finance investments and fixed assets and for general working capital purposes. Do note the application is open from tomorrow 9 am (20th March) till 26 March 12 pm.